I am delighted when love wins over fear, doubt, and darkness, especially as we grow older and experience how bad love can turn or the losses that are incurred when one is bold enough to say yes to love. The woman, my manager for five years when I worked corporate many, many moons ago, was delighted when her partner surprised her at their “new home” party on the weekend with the proposal and the ring. Life can beat the romance out of us, can even jade us to the point of loneliness for not just the fear, but the knowledge that loss will come for letting love in, especially as we grow older and more aware of the fact everyone dies. But then, maybe that is the reason I applaud and admire Shane and Roseanne for their bold decision not just to quietly embrace love, but to publicly declare their love with an engagement and marriage, though probably not a baby carriage to follow, as being a grandmother fills that space now. Congratulations Shane and Roseanne! May your lives together be filled with much love, laughter, and joy, plus your sorrows few and shared. Amanda Marshall best sings my wish for you in her “Believe in You” video on YouTube … because you matter. Be the best you because I believe in you too! The Foundation to be established as soon as possible will more effectively and efficiently enable the for-profit company to transfer company profits to the Foundation in order to provide free books, products, and services to those in need, but without the resources to purchase rather than what a social business venture could do, especially since social business ventures, as for-profit organizations are still legally works-in-process in many places, including Canada. Without an active, engaged by-the-majority global initiative that surpasses religion, politics, race, etc. we all lose freedom and our rights are diminished. Condolences to all victims, family and friends of terrorist acts, including Spain a few days ago and now Finland. Grateful for the range of consultants’ expertise being shared, both the theoretical and experiential knowledge, by the consultants writing books for more effective, efficient management of organizations. Without a high school education, but a knack for organizing and leadership, in my early twenties I was thrust into management as Assistant Manager for a chain department store in a community of ten thousand, which was the beginning of my professional leadership roles. Since then, whether head cashier, office manager, storefront manager, corporate human resources, operations, and financial planning team member, plus as founder for a couple of non-profits, (please see this blog’s page, About Kaitlin Ann Trepanier, to also review my subsequent education and professional credits), I have needed two things. The first was to learn what needed to change in me to be the most effective, yet also the most respectful leader. The second was to study management experts because I knew in my heart the day would come when I would run my own company and here I am, self-aware of my strengths and what I also need to do to transform any shortfalls into strengths also. Thankfully, I learn extremely well from books, as well as, testing the material by experiment, which is why I must say “Thank You” to all those who have shared their wisdom to aid my transformation from middle management knowledge and skills to senior/executive. The latest to add to the list of teachers and books are the authors Jeffrey Ford and Laurie Ford. Jeffrey Ford is associate professor of management in the Fisher College of Business at the Ohio State University in Columbus. Laurie Ford is a consultant to managers and executives in business, government agencies, and associations on organization redesign and change implementation. Jeffrey and Laurie’s book, The Four Conversations, Daily Communication That Gets Results, is the latest in the arsenal of knowledge transforming me into the executive I have known in my heart for years I was destined to become. The journey has been very long, very untraditional, yet also very powerful in enriching my natural proclivities, developing new ones, and emboldening me with what is needed to meet the goals. Now, it’s back to reading and the two books waiting to be finished and released this fall for the company’s surge ahead. Best wishes to you and your own endeavours moving you closer to the fulfilment of your dreams. Never give up … just stay open, focused, and adaptable. Oh yes, and patient. 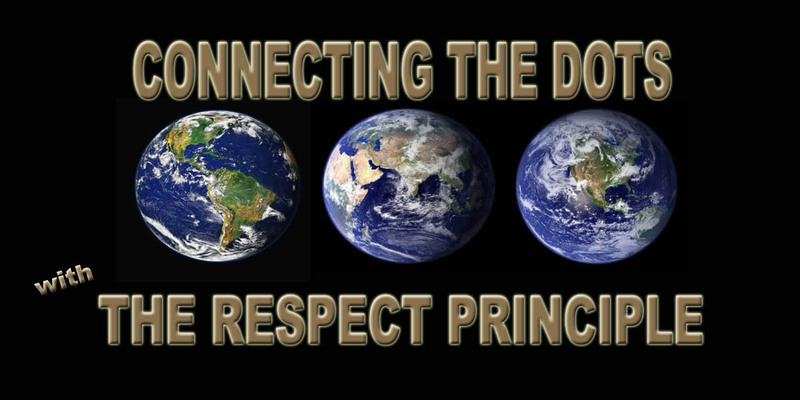 What you bring as accountant to the for-profit Connecting The Dots With The Respect Principle company is not just your valuable accounting principles knowledge and expertise, but also three other very necessary assets. First, you have accounting expertise also in international accounting principles and laws. Second, you are well versed in biblical finance practices. And thirdly, yet the most important of all because of what the company is all about you have the combined commitment to financial success supported by a high level of respect for all people.